Fast forward to now, five months later. I’ve completed the Peer Support Worker Training Course and submitted my assignment. I’m tempted to write that sentence out again as I can’t quite believe it myself! So why am I so amazed? Well there’s a few reasons really, one is that I had truly lost all hope. I felt that nobody could help me. Several sections and inpatient stays, numerous medications and some taking therapies, yet still I felt worthless and lost. I forgot who I was, and became somebody I didn’t know or like. I pushed everyone away no matter how well-meaning they were. I’d often walk out of courses and therapies as I either didn’t believe they would work, or it just felt too difficult. Then along came Peer Support. How strange and alien it felt, to sit in a room of people, many with shared experiences similar to my own. Then as I talked to others and shared some of my story, peer support became my new addiction. How powerful and validating it is to sit and talk to someone who shares a direct lived experience. Just that knowing look and nod is sometimes enough. As each day of the course went by, my confidence grew. Skills that had lay dormant for ages, were re-awakened in me and before long, I had a wonderful group of peers around me to learn and grow with. Of course, this isn’t a fairy tale (not quite) I did have the odd moments where the old ways of thinking would come back. ‘I can’t do this’ and ‘I’m not good enough to do this.’ But with a supportive group of peers, some great life affirming tutors and trust staff that believed in me, I was encouraged to keep going. I silenced those critical voices and completed the course. In addition, my view of recovery has totally changed. Now I know that for me, it’s not a linear journey. I take comfort from knowing that there are peaks and troughs. My social networks have grown, my peer support group have already been out for a great curry after the training, where we sat and gave each-other some great, organic peer support. So I’ve got more friends too now! The ultimate thing for me personally is that I’ve found a passion again. I have learnt so much about myself, about recovery and about restoring hope in others. Peer support training for me, has been life changing. I hope to now work in the field of mental health as a Peer Support Worker and have just submitted my application to do so. That’s great isn’t it, but what is even more powerful is the fact that even if this first application is not successful, I know I will be. I hadn’t heard about Peer Support until that life changing day on the ward. I hope that Peer Support grows and grows and lifts more people out of their darkness. I hope that more people like me can find their passion and purpose again. I hope that Peer Support becomes available to all that want and need it. Did I just say hope? What a wonderful word! A post today by Jo Higman, who is a Research Nurse. You can contact Jo if you’d like to discuss her research at Jo.Higman@nottshc.nhs.uk. I’ve recently completed an MA in Health Communication at the University of Nottingham. When casting around for a topic for my dissertation, I was struck by the pervasiveness of mindfulness, in both popular culture and academia. Mindfulness based cognitive therapy (MBCT) is recommended by NICE (2009) as a relapse prevention strategy for recurrent depression. Furthermore, mindfulness in one form or another has been embraced by the academic and health community, as evidenced by the >1000% increase in publications on the subject in the last 10 years (Web of Knowledge, 2015). 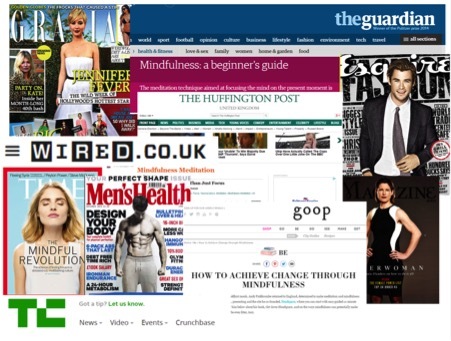 In parallel, there has been a proliferation of features promoting mindfulness in popular media. (Presently, a mindfulness colouring book is amongst Amazon’s top 10 bestsellers.) I began to explore how this centuries old practice was being discussed, with a view to explaining in some small way its growing popularity. Leafing through magazines, blogs, newspapers and websites, it soon became apparent that, almost without fail, these articles referenced one man, or his company: Andy Puddicombe, founder of Headspace. Fig 1 shows just a few. Headspace is an online and mobile application, offering a mindfulness meditation programme on a subscription basis. The website is colourful and inviting, featuring text and images to market their product (fig. 2). Given the rich visual data, I applied multimodal critical discourse analysis (MCDA) to interrogate the Headspace website. MCDA examines both language and images, with the aim of revealing hidden ideologies and power interests. Demonstrated as an effective approach for analysing websites by Thompson (2012) and Harvey (2013), it exposed some interesting findings, a brief outline of which are included here. Modality refers to the truth value in text and images, and can often be found in modal verbs such as must, will, should, etc. But how is modality expressed through the visual choices made. Kress & van Leeuwen (2006) identify a number of ways this can be analysed, including colour, context, actor and props and so on. 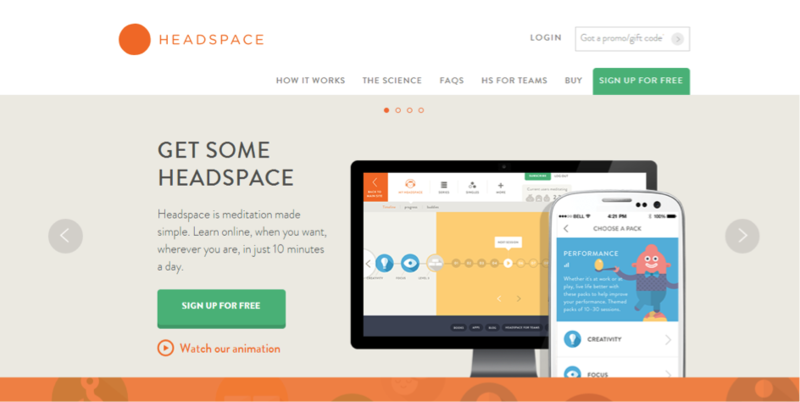 Initially, the Headspace website appears to consist largely of abstract images, low in modality. However, with the use of symbols, props and metaphors, modality is increased. Importantly, these images are clean, simple and replete with icons of modernity, such as laptops, mobile phones and (dare I say it?) beards. This is essential in lifestyle advertising and brings us on to the marketing strategies used by Headspace. First of all, in order to offer a solution in the form of their mindfulness programme, Headspace need to construct a problem. This is done very skilfully on the site, through the lexical and visual choices they make. The website features a number of potential ‘problem’ areas, using buzzwords such as ‘creativity’ and ‘focus’ to tap into the zeitgeist of lifestyle consumerism. However, their main focus is that curse of twenty-first century living, stress. Whilst explicitly including stress as a topic on the site, they also discretely and repeatedly construct the notion within the consumer that modern life is hectic and stress is an obvious side effect. Here, the ‘life as a circus’ metaphor is used to excellent effect. The clown like character in the illustration is clearly engaged in a number of circus activities, spinning plates and a balancing act (multi-tasking!). 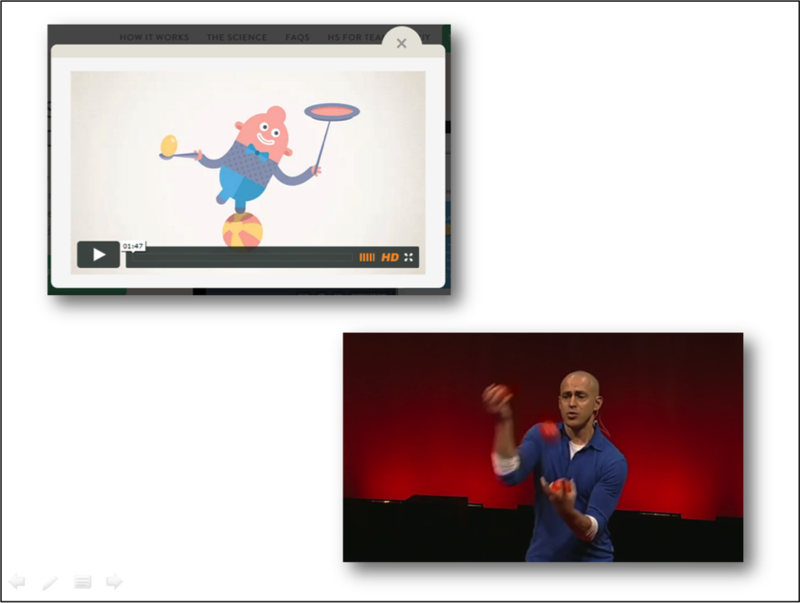 This is reflected in the still from Andy Puddicombe’s TEDTalk (TED, 2012), which he delivers whilst juggling tomatoes throughout. ‘Juggling,’ ‘spinning plates,’ and ‘a balancing act’ are all phrases we use to describe our lives, and here they are being reflected back at us. The viewer can easily interpret and identify these images through this skilful use of metaphor. It is your life that is a circus. You are the clown in the image, spinning plates in the hope that it all doesn’t come crashing down. If the viewer opens the TEDTalk clip, the language used by Andy further reinforces these images: “We live in an incredibly busy world. The pace of life is often frantic. Our minds are always busy, and we’re always doing something.” (TED, 2012). Here the use of ‘we’ and ‘our’ suggests a conversational ‘we’re all in this together’ scenario, when in fact it is a means of making an individual feel as if they are being spoken to, when realistically they are part of a mass audience. Again, a strategy frequently found in advertising discourse. They gave us ‘the science.’ Now described by them as ‘the obligatory science message’ (GoodPilot, 2014) in health and beauty marketing, it is rare to find such an ad these days without a cascade of ‘science’ to support the benefits of the product. In that respect, Headspace are no different. In the persistent navigation across the top of the page, there is ‘The Science,’ given added weight by means of the definite article. They frequently refer to ‘studies,’ ‘research’ and ‘scientists.’ The site is replete with icons and symbols to represent science: men (always men) in lab coats, test tubes, and so on. The text accompanying the images is high in modality, yet there is more hidden behind the images than is first revealed. A test tube is pictured emitting gas, but the gas has eyes. This personification of inanimate objects is a common strategy in New-Age self-help (Askehave, 2004), but is also a means of obscuring agency. That is to say, who is making the claims about science and brains changing shape? It is not explicit and we are distracted by the somewhat cute looking gas! There is much, much more to the Headspace website, and this is just a snapshot of what may be revealed when using multimodal critical discourse analysis. If nothing else, I would urge you to have a look at the TEDTalk, which is a masterclass in skilful presentation and effective marketing. There are so many areas of the site which can’t be included here, but hopefully this has given a flavour. It is important to end on this note; despite the analysis above, it is worth considering the Headspace programme in the context of an impoverished health service. The majority of those with depression and other common mental health problems are unlikely to access treatment of any kind on the NHS, less likely mindfulness. Given that a private therapist costs upwards of £60 a time, Headspace offers users an opportunity to try something which, for the price of a couple of lattes, may offer them a strategy to manage what can often be a chronic and debilitating disorder.